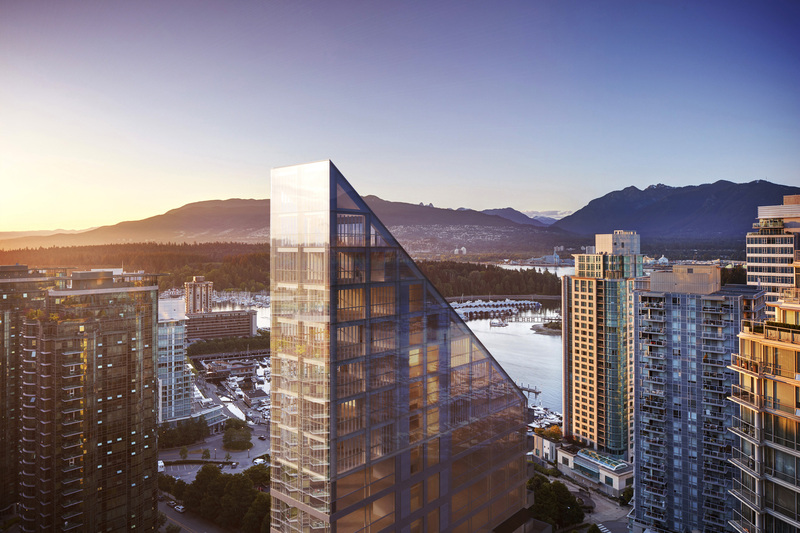 A design by award-winning Japanese architect Shigeru Ban for the world’s tallest hybrid timber structure is poised to be built in downtown Vancouver. When complete, the wood, glass and concrete building will stand 19 storeys and 71 metres tall — one storey higher than the wood-hybrid Brock Commons at the University of B.C. — said Tobi Reyes, the CEO of PortLiving, the Vancouver-based developer behind the project. 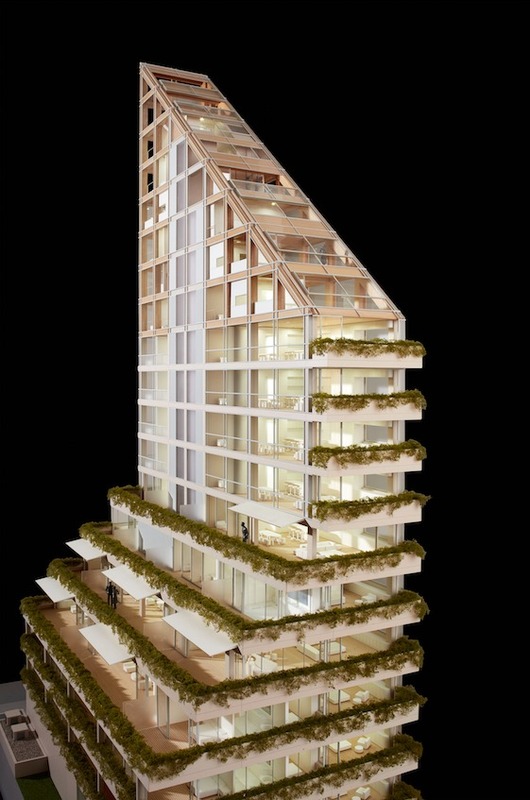 Ban designed the residential tower, Terrace House, as a tribute to late architect Arthur Erickson’s decades old neighbouring building, Evergreen, at the corner of Jervis and West Hastings streets. “On a philosophical level, it really feels like our project completes the Evergreen building,” he said. “There’s this relationship between the two and I think it’s really interesting how Shigeru pays homage to Arthur. Ben Albertson, a project architect at Shigeru Ban Architects, explained that relationship. 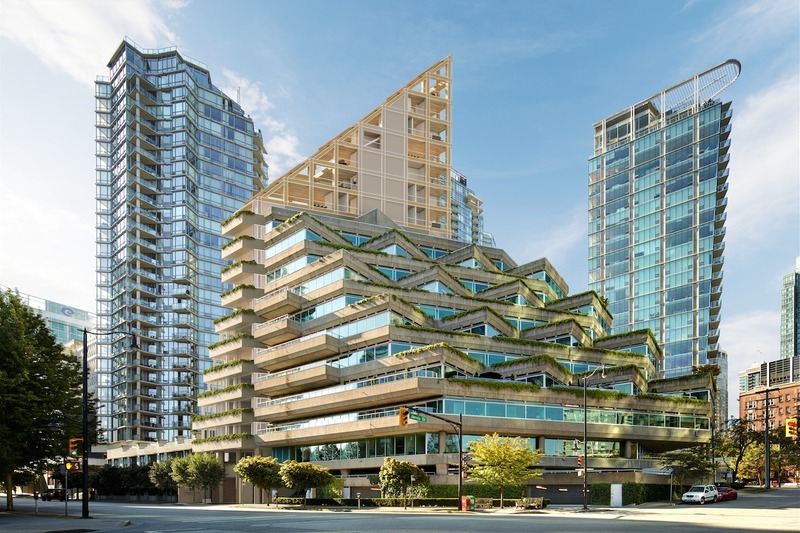 To do that, Ban used triangular shapes, natural materials and terraces to connect the two designs, and enlisted Cornelia Oberlander, the landscape architect for the Evergreen building, to work on the project. While concrete and steel were the primary building materials in the 19th and 20th centuries, wood was considered to be too weak for massive sructures, Albertson said. That’s changing. Also on the project is wood structural engineer Hermann Blumer, who previously worked with Ban on the Centre Pompidou-Metz in Paris, France. Ban won the prestigious Pritzker Prize thanks in part to his design for that building, which placed him in the company of some of the world’s top architects. Though Reyes said building a taller wood structure than anyone else had before “wasn’t by design,” there is something of an ongoing competition for the title of world’s tallest. For now, Brock Commons at UBC is the record holder. The student residential building stands 18 storeys (53 metres) tall and was built last September. Meanwhile, architects are working on a 57-metre tall tower for Bordeaux, France, a 73-metre tower for Amsterdam, The Netherlands, and a 304-metre tall skyscraper for London, England — all in wood. But as Reyes said, though there are lots of announcements about tall wooden buildings, few of them are permitted like his is. PortLiving has a development permit for Terrace House and it is now seeking a building permit. Interested in receiving information about Terrace House? Enter your name and email to receive updates on this exciting new project.